Free Kittens in Memphis – All Night Long! | YesBiscuit! Free Kittens in Memphis – All Night Long! Pet rescuer Villy from Meows and BowWows reports that there is something fun to do tonight in Memphis – adopt a kitten. There are 4 litters at the Animal Emergency Center. But wait, there’s more! Two of the litters have kittens that are old enough to adopt separately. There is no adoption fee. All the litters have been tested negative for FIV/Feline leukemia and have been de-wormed. They will also be de-flea’d additionally if there are any residual fleas. Anybody interested to see/ adopt/rescue the cats and kittens can do so starting tonight at 6pm and all night until 8 am. Their phone # is (901) 232-4563. If you get one of the all night partay kittens (mama cats are available too), send us a picture! Sample mama cat and kittens. Your actual kitten may vary, depending on how many people get there before you. Who Should Be Fighting for the Animals at MAS? Gosh! I just LOVE kittens! :) Hope they all get wonderful homes tonight! If you are looking for a cat or kitten to adopt, please consider these babies. If not adopted from the Emergency Center they will be transfered to the Memphis Animal Shelter on Friday. We really hope that many of them get adopted before that. If you happen to speak with the emergency clinic tonight, can you let us know if any kittens/cats have been adopted. I find it kind of exciting. Like an all night dance marathon. With kittens. So sweet! Hoping they all find great homes. Keeping my fingers crossed that they all found homes so they don’t have to go to THAT place tomorrow. Poor little creatures . . .
i adopted one of these sweet babies last night and she fits perfectly in my home!!!!!!!!! She is already walking around like she own’s the place!!! her “big brother” was quite excited to have a new friend to play with, and they’ve been inseperable ever since! :) He’s showing her how to get into all kinds of kitty mischief!!!!!! thank you so much for everything you do!!!!!!!! Thank you for adopting Janessa. If you get a chance to send in a pic, that would be great. This is so wonderful! Thank you so much for stepping up and rescuing a kitten. Just to let you know, two of the litters with their mamas have gone to the Collierville shelter where they will be safe and will be adopted. 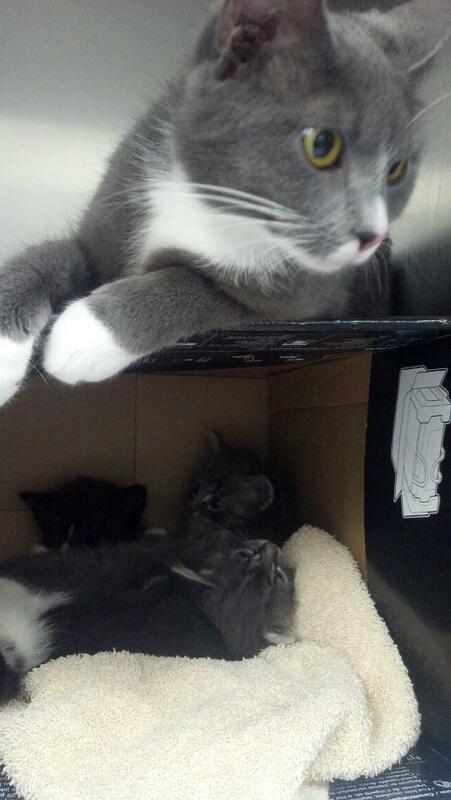 One litter is left at the emergency clinic. Their time has been extended by a week and if they are still homeless by then, we have a foster home lined up for them, so they should be safe too! Please don’t forget about the mamas as they need homes too! I”m looking for a kitten can I still get one? I would call or drop by the clinic and see if they have any kittens in need of homes today. Let us know! I’m happy to say that all the kittens were adopted and they only have bottle-fed ones now. I’ll continue looking for another kitten but I’m thankful those cuties found a loving home! Great news. Thanks for letting us know. If you don’t find one sooner, the bottle babies will be ready for homes in 6 weeks or so I would guess. Yay! So glad to hear of them all getting adopted. Thanks for your being responsible in promoting them, Shirley! Are there still more to be adopted or rescued? !